Last October we went to the makeshift refugee camp in Calais called ‘the Jungle’. I wrote this when we got back. I have a British passport. I didn’t choose it. I’ve never really thought much about the value of it. However having spent the weekend at the refugee camp in Calais I now know that I have an amazing level of freedom because of it and thousands of people do not. 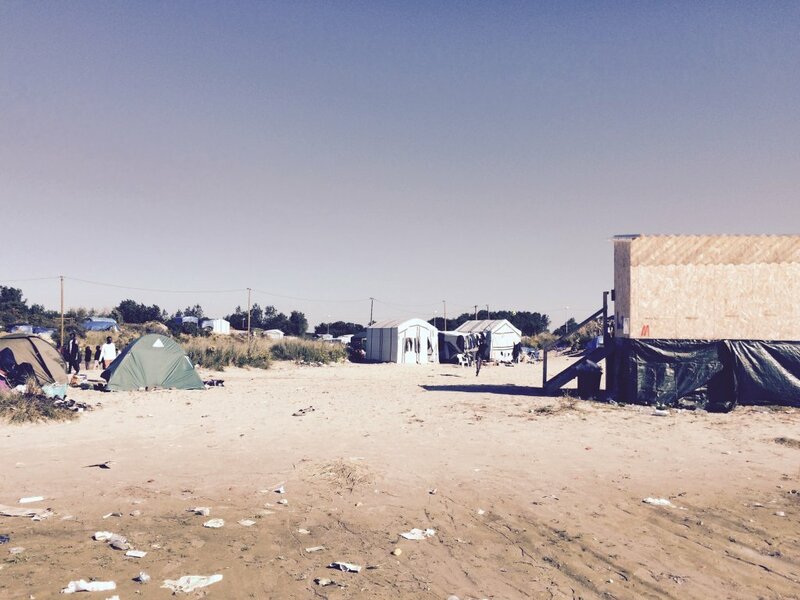 This weekend we went to the refugee camp known as ‘the Jungle’ in Calais. 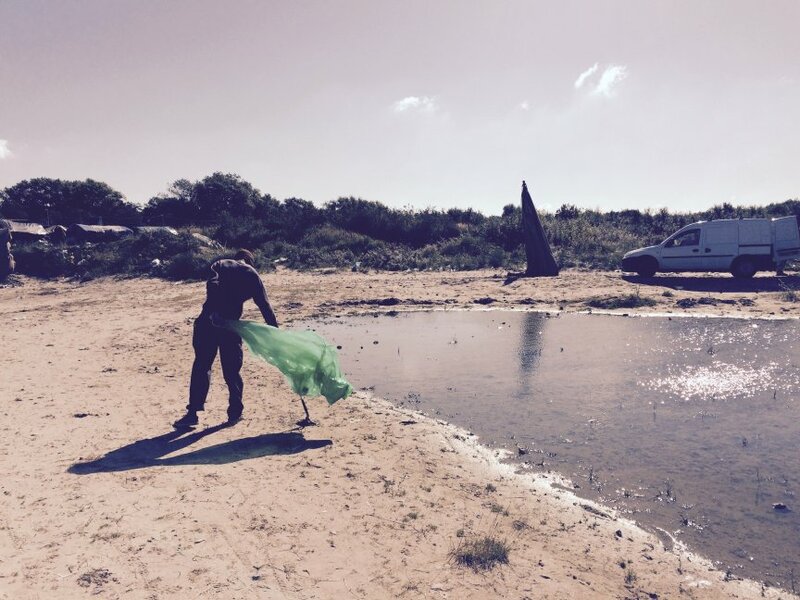 We were going to help with clearing up the camp with around 120 others from the UK. Despite being prepared and having read lots of people’s reports of what we would face there it was still a shock to see the state of the camp. There are no bins in the jungle so there was rubbish everywhere. 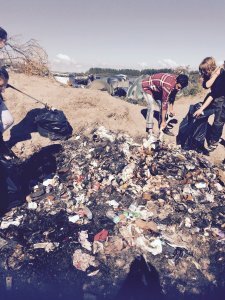 The council has provided a few skips in the camp but there is no regular collection of rubbish that is not in the skips and the refugees we met didn’t have any bin bags so it seemed people would just pile it up all around the camp. We met some lovely volunteers who really did change the camp over the weekend by taking away stinking great mounds of rotting and sodden trash. People who were willing to get their hands dirty and show the refugees that they care. We were humbled by the welcome and gratitude shown by the refugees. Lots of them wanted to help us and asked us for litter pickers/shovels/bin bags so they could join in. One special person we encountered was Harun. Harun is a 10 yr old boy from Afghanistan who was so excited to get a shovel and join us. He had an open wound on his leg but didn’t want that to stop him (despite our best efforts!). He was shovelling maggoty, rotting food, tins, wet clothes (unsuitable donations mainly) and didn’t complain apart from telling us that it smelt bad. He seemed to enjoy the time he spent clearing up but I couldn’t help thinking that a 10 yr old should be playing. Hanging out with friends. Not scooping up rubbish in a refugee camp where he has little freedom. I’ve been praying he finds a way to reunite with his family. He told me his dad is in England and hopes he will come back in a few days for him. I don’t want to get into the politics of whether or not these people should or should not be allowed to claim asylum – we all have our own opinions and I’m not looking for an argument. What I know is that they are people, like you and me. People who didn’t choose where they were born. They don’t have the freedom most of us do and how can that be fair? My brain is still struggling to process it all. Sorry for the long and rambly post.